With 2018 rapidly coming to a close and one of the top censored stories of the year being the online censorship of not only Conservatives and the independent media but the anti-war left as well, we'd like to begin this story by giving a huge thank you to everybody who has helped ANP remain in this war for the future of America. By reading and sharing our stories and via your incredibly timely donations, you've helped us to continue this truly existential battle for America's future for another year. And despite all of the problems our nation is going through, we as Americans truly have so much to be thankful for. Thank you all. And while many on both the left and the right complain about the country we live in and the direction we're headed for many legitimate (and illegitimate) reasons, ANP still being here in November of 2018 going into 2019 is absolute proof that 'freedom of the press' is still alive in America, despite what CNN and the totally controlled mainstream media would like us to believe. 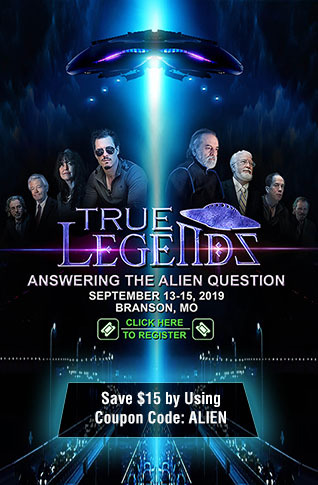 As we've mentioned here before, Susan and I and all of our contributors have the freedom to write whatever stories we want. We're not dictated to stay away from topics such as false flag terrorism, the heavy corruption within the 'deep state' and the Democratic party and we're happy to tackle 'keep your distance' topics such as weather modification, the fall of America into globalism, MK-ultra controlled 'deep state' shooters and any other topic that interests us. Yet as we've seen throughout 2018, horrific censorship of the independent media and Conservatives online by 'big tech' and out in the streets by groups such as antifa is being used in attempt to push a totalitarian agenda upon America. A direction that should America finally reach, we may never be able to return from. As Steve Quayle mentioned in an SQnote while linking to this story over at the Gatestone Institute titled "Big Tech Snuffing Free Speech: Google's Poisonous 'Dragonfly'", "First they censor the truth tellers, then they kill them! Note the disappearance and murder of investigative journalists that are increasing worldwide?!" As we had reported on ANP back in August, another investigative journalist who had been going after the #ClintonCrimeFamily had recently suffered a mysterious death, something that seems to follow the Clinton's where ever they go. And if they can't kill us, they just do their best to silence us. Just as Susan Duclos reported on ANP on November 15th, youtube's decision to censor videographer Lisa Haven, labeling her video titled "Martial Law Dead Ahead? 72 Beliefs Targeted In Official Govt Documents - The Endgame's Here" as 'inapropriate' or 'offensive' followed by months the silencing of Alex Jones by big tech earlier in the year, proving Susan's August 6th story titled "First They Came For Infowars....Tomorrow We Will All Be Alex Jones" right on the money. And while the mainstream media and the Democratic party will never admit that the completely Orwellian censorship that we've been witnessing has been well coordinated, when we look deeply enough we can see that all of this is much more than just 'censorship' but designed to permanently deliver America into the globalists hands. And while some think globalism the 'answer' to America's problems, who benefits from the destruction of the 1st Amendment in America? Certainly not every day, law abiding Americans. And with google's argument echoing this June 20th story over at the Wall Street Journal which reported that the ACLU was retreating from defending 'free expression', declaring that speech it doesn’t like can ‘inflict serious harms’ and ‘impede progress’, the ACLU days later put out this story denying the credibility of the WSJ story though the damage had been done and the ACLU exposed for also moving towards totalitarianism should they turn away from protecting free speech, even if that speech is considered 'hateful' by some. And as we've been reporting on ANP time and time again, we've been witnessing the fall of the ability to speak freely for people all across Europe, Canada and Western civilization as people criticizing Islamic terrorism are labeled 'Islamophobists' while those criticizing gays are labeled 'gay bashers' while a white person criticizing a person of any other race for anything is labeled a 'racist'. As WND recently asked, "Why must everyone adhere to human rights except Muslims?" 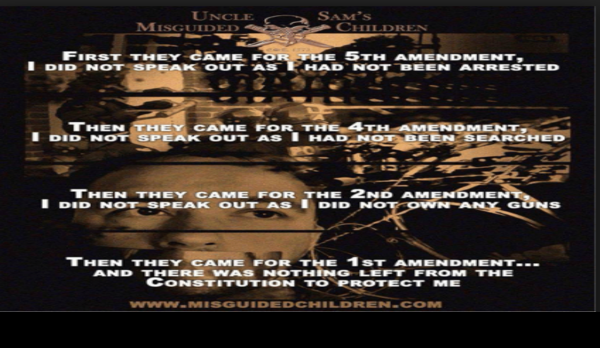 With an actual US Federal Judge recently dismissing charges against two doctors and six others who were carrying out genital mutilation upon 9 young girls in Detroit also showing the way America is headed, and journalist Laura Loomer kicked off twitter for criticizing a Muslim congresswoman for correctly stating that she was "anti-Jewish, and a member of a religion that oppresses homosexuals and abuses woman", we see truth has become treason in this empire of lies. 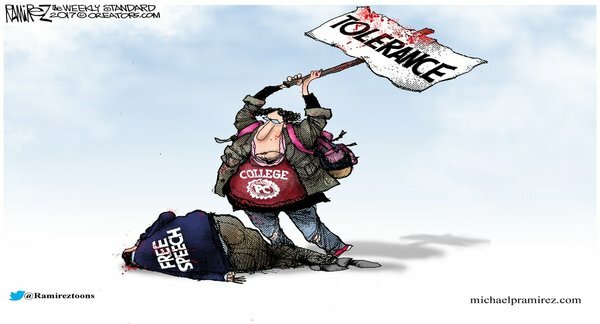 And as Susan had reported on ANP on November 21st, with 'snowflakism' having gone mainstream and the language police using offended snowflakes to silence dissent, where does America go from here with our 'institutes of higher learning', colleges and universities all across America having 'declared war' upon free speech with Conservatives shouted down and silenced from coast to coast. 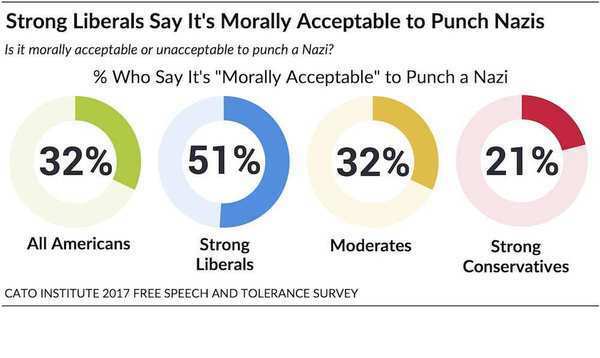 And then as we see in the screenshot above taken from this 2017 survey on free speech and tolerance by the CATO Institute, 51% of so-called 'strong liberals' actually believe that it is morally acceptable to 'punch Nazis', with a shocking 32% of ALL Americans also agreeing. But the mainstream media and many on the left are more than happy to associate ALL President Trump supporters as 'Nazis', so it's ok in the eyes of many on the left to violently attack and deliver beatdowns to such 'Trump supporting Nazis'. How long until that mindset leads to all-out civil war in this nation? Perfectly illustrated in this November 19th story over at the Philly Police Blog which reported that a group of United States Military Reservists were violently attacked and robbed in Philly by a bunch of antifa terrorists, with the group calling the Reservists 'Nazis' and 'white supremacists', how could nearly 50% or more of America be racists, nazis and white supremacists simply for supporting President Trump and his agenda to 'make America great again'? So with 2019 now just ahead and the 2020 presidential election season sure to be one of the top stories of the new year, we gear up for the battle ahead while being reminded that according to one globalists talking head, much more Orwellian censorship of the independent media to come while even the website France 24 recently confirmed that Chinese-style 'digital authoritarianism' has been growing globally. As we hear in the first video below, the freedom of the press here in America has been hijacked and is absolutely being threatened by globalism.